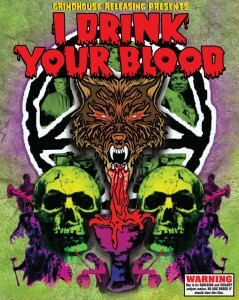 Grindhouse Releasing’s 2-disc deluxe edition of I DRINK YOUR BLOOD is now the #1 best selling Blu-ray at DiabolikDVD.com! David E. Durston’s ’70s hippie horror classic is screening Nov. 27 at the Alamo Mission in SF and Dec. 3 at the Music Box Theatre in Chicago. Grindhouse Releasing has sent along a limited supply of official I DRINK YOUR BLOOD “HORROR HYPO” syringes to theaters for the upcoming engagements. To get your HORROR HYPO, be one of the first 3,000 customers to buy the Blu-ray – available now from Diabolik DVD, Amazon, and in stores everywhere Tuesday, Nov. 22! 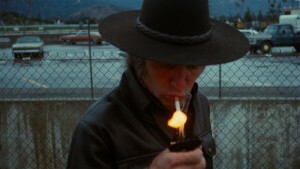 “The old Grindhouse Releasing special edition DVD release of I DRINK YOUR BLOOD was fantastic but this Blu-ray reissue is leaps and bounds above…Not only does the movie look and sound better than ever but it’s got some impressive new supplements and it comes packed with two additional feature films also debuting in HD. The movie itself holds up incredibly well, a no-holds barred epic of nasty, exploitative horror that is as ridiculously entertaining now as it has ever been.” – Rock! Shock! Pop! HOLLYWOOD, Calif. – Grindhouse Releasing, the award-winning “Criterion of cult movie labels”, has set a Nov. 22 street date for the new deluxe Blu-ray edition of David E. Durston’s gruesome and graphically violent 1971 horror favorite I DRINK YOUR BLOOD. 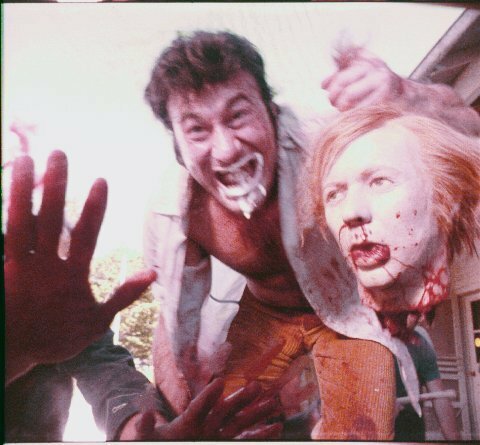 It’s NIGHT OF THE LIVING DEAD meets the Manson Family in this gore-drenched tale of LSD-crazed hippies who go on a murderous rampage through a small town after consuming rabies-injected meat pies! Grindhouse Releasing’s deluxe 2-disc Blu-ray set not only presents the ultra-violent, uncensored director’s cut of I DRINK YOUR BLOOD in a new hi-def transfer but also includes two more vintage exploitation films in their HD debut: Del Tenney’s I EAT YOUR SKIN (1964) and Durston’s long-unseen, X-rated psychedelic shocker BLUE SEXTET (1969). Packed with new bonus features not seen on Grindhouse Releasing’s 2002 DVD release, the I DRINK YOUR BLOOD Blu-ray is the ultimate edition of a notorious “Blood Horror” classic. The first film to be rated X for violence, I DRINK YOUR BLOOD was a huge-grossing hit at drive-ins and “grindhouse” theaters but was severely censored during its original release. 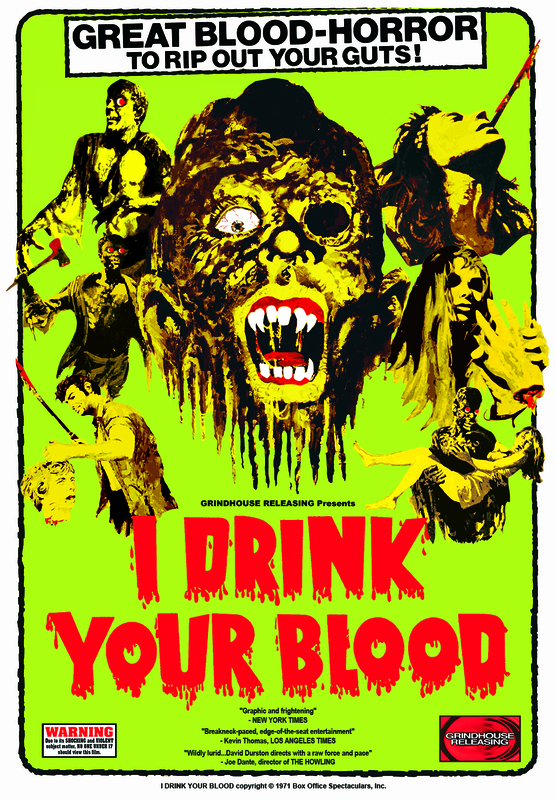 Grindhouse Releasing’s uncut, restored version of I DRINK YOUR BLOOD recently debuted in New York and Los Angeles and is now playing theaters across the U.S. and Canada. I DRINK YOUR BLOOD stars Bhaskar, John Damon, and cult superstar Lynn Lowry (George A. Romero’s THE CRAZIES, David Cronenberg’s THEY CAME FROM WITHIN, and Paul Schrader’s THE CAT PEOPLE). 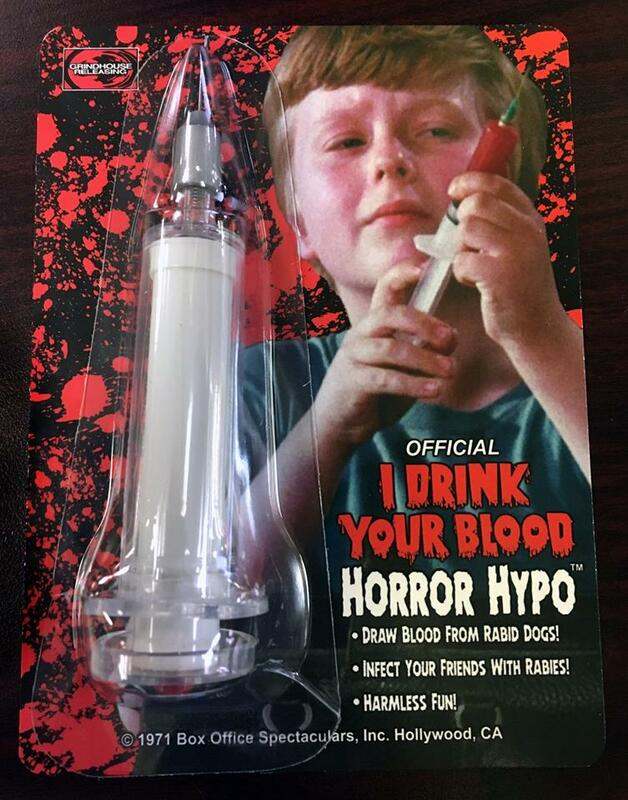 A limited run of 3,000 copies of the Blu-ray will include the official “I DRINK YOUR BLOOD Horror Hypo” – an actual syringe that fans can use to infect their friends with rabies! Supplies of the Horror Hypo are not expected to last long, so fans should pre-order from DiabolikDVD.com to get the best shot at receiving one! 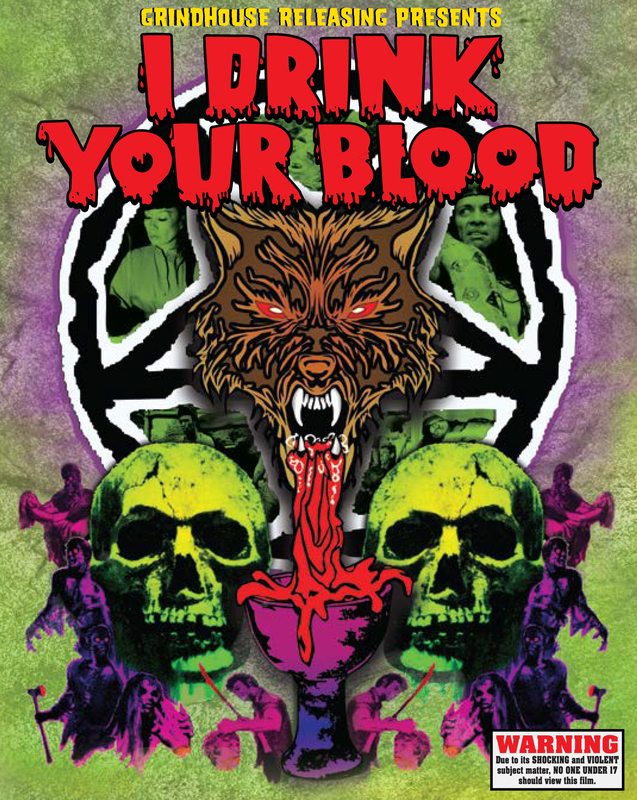 The I DRINK YOUR BLOOD Blu-ray is now available for pre-order exclusively at DiabolikDVD.com – click this link to reserve your copy! – 4 controversial deleted scenes including the original blood-drenched ending deemed too disturbing for ’70s audiences! BLUE SEXTET (1969) – David Durston’s long-lost X-rated psychedelic shocker – presented for the very first time on home video! – BONUS – I DRINK YOUR BLOOD HORROR HYPO – Inject your friends with rabies! – limited to the first 3000 copies! For theatrical bookings and publicity contact info@grindhousereleasing.com. Grindhouse Releasing is bringing David E. Durston’s I DRINK YOUR BLOOD back to theaters, in an uncut and uncensored 45th anniversary release! 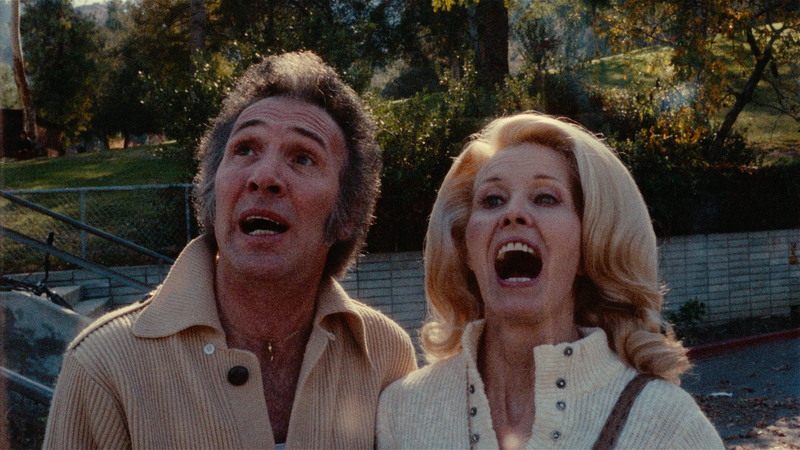 It’s NIGHT OF THE LIVING DEAD meets Charlie Manson in this gore-drenched 1971 drive-in classic. After consuming rabies-infected meat pies, an LSD-addicted hippie cult goes on a vicious murdering rampage! Heavily censored since its original release, this infamous landmark of cinematic brutality is being presented in all its blood-splattered glory. 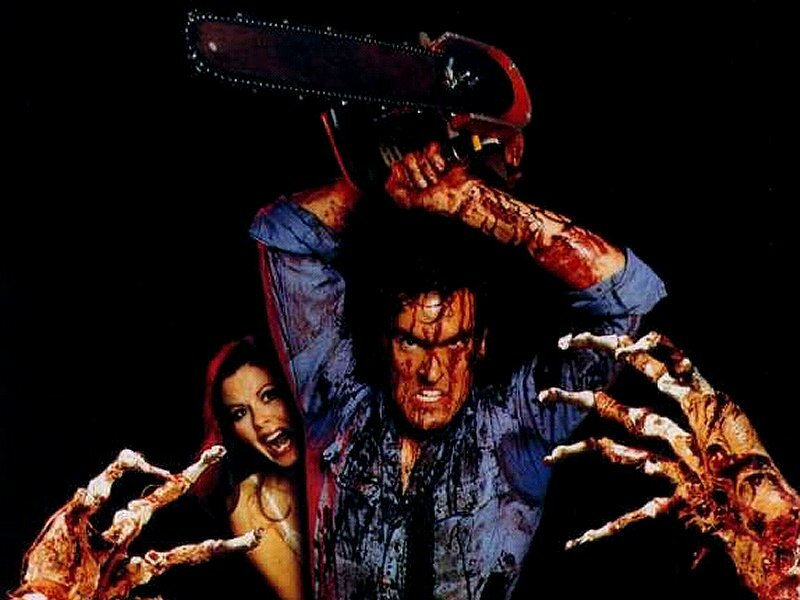 Check out the Grindhouse Releasing screening calendar for more upcoming theatrical screenings of Sam Raimi’s EVIL DEAD, Lucio Fulci’s THE BEYOND and CAT IN THE BRAIN, Ruggero Deodato’s CANNIBAL HOLOCAUST, and more! 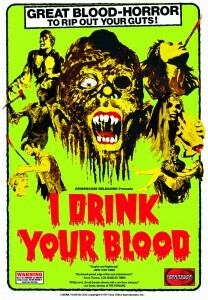 Stay tuned to GrindhouseReleasing.com for more I DRINK YOUR BLOOD screening dates and Blu-ray news coming soon! We’ve added more screenings to our summer 2016 U.S. theatrical release of Lucio Fulci’s gore-drenched masterpiece CAT IN THE BRAIN! Acclaimed Italian horror maestro Lucio Fulci, director of ZOMBIE and THE BEYOND, stars in this blood-soaked epic as a director being driven insane by his own movies. Fulci is thrust into an ultra-violent nightmare of death and depravity where murder and madness consume his sanity in a vortex of violence. Here’s where you can see the movie coming up! More theaters and dates coming soon; and pick up the deluxe 3-disc Blu-ray/CD set now at Amazon and Diabolik DVD! The Most VIOLENT Movie Ever Made – Starring Godfather Of Gore Lucio Fulci! 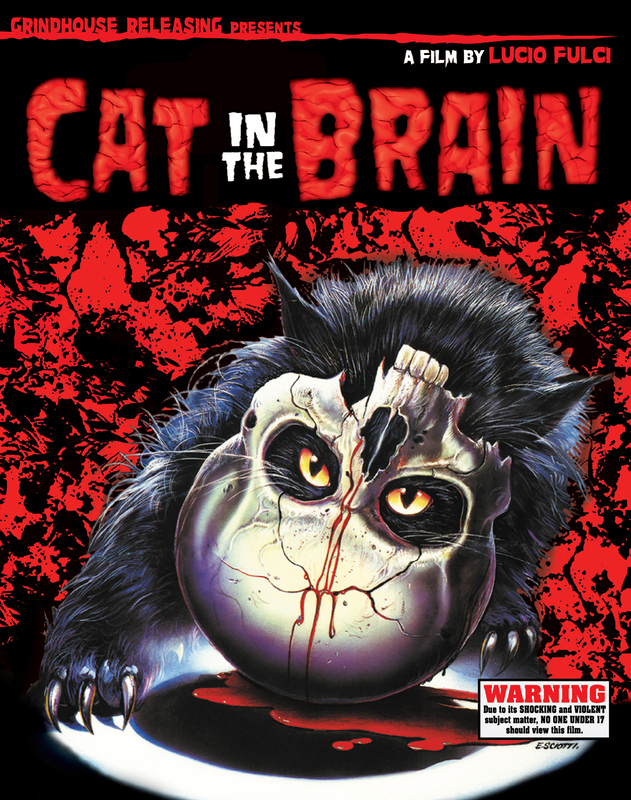 HOLLYWOOD, Calif. — Grindhouse Releasing has set a July 12 street date for the new deluxe 3-disc Blu-ray edition of Lucio Fulci’s nightmare classic CAT IN THE BRAIN. The movie will be touring theaters all over the U.S. this summer, starting June 2. CAT IN THE BRAIN is a psychological masterpiece in the tradition of such cinematic classics as PSYCHO, STRAIT-JACKET, ERASERHEAD and Fellini’s 8 1/2. Acclaimed Italian horror maestro Lucio Fulci, director of ZOMBIE and THE BEYOND, stars in this blood-soaked epic as a director being driven insane by his own movies. Fulci is thrust into an ultra-violent nightmare of death and depravity where murder and madness consume his sanity in a vortex of violence. 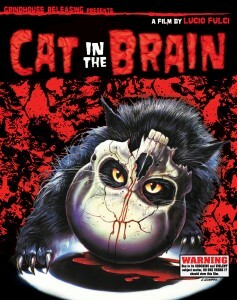 As with Grindhouse Releasing’s #1 best-selling smash PIECES, the new Blu-ray release of CAT IN THE BRAIN will be issued in two versions: the standard release, and a special edition for collectors limited to 3,000 copies. The limited version of the CAT IN THE BRAIN Blu-ray includes a glow-in-the-dark slipcover and an original portrait of Lucio Fulci created especially for this release. Grindhouse Releasing advises all customers who want to be guaranteed a copy of the limited edition to pre-order from Diabolik DVD, as Diabolik customers will get first priority and will receive the set early. Supplies are not expected to last long — if you do not pre-order from Diabolik DVD, there is no guarantee of receiving one of the limited collector’s copies. 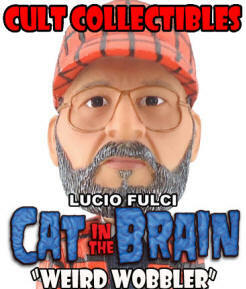 As an additional exclusive, Diabolik DVD is offering a special bundle that includes the CAT IN THE BRAIN Blu-ray and the official Lucio Fulci bobblehead from Cult Colletibles. This offer is limited to 500 copies, as these are the last of the numbered Lucio Fulci “Weird Wobbler” bobbleheads – when they’re gone, they’re gone! – BONUS CD – the original soundtrack by Fabio Frizzi! – David F. Friedman, legendary producer of BLOOD FEAST and ILSA, SHE WOLF OF THE S.S.
More theaters and screening dates coming soon! Visit GrindhouseReleasing.com for updates! 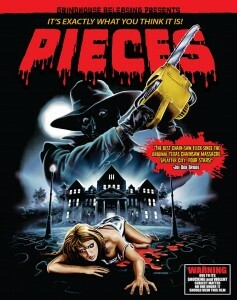 Grindhouse Releasing Presents PIECES on Blu-ray! YOU DON’T HAVE TO GO TO TEXAS FOR A CHAINSAW MASSACRE! Grindhouse Releasing is proud to present the sickest and most violent of all the early ’80s slasher movies. A psychopathic killer stalks a Boston campus, brutally slaughtering nubile young college co-eds, collecting body parts from each victim to create the likeness of his mother who he savagely murdered with an axe when he was ten years old! PIECES is a wild, unrated gorefest, with enough splatter and sleaze to shock the most jaded horror fan. Order now from Diabolik DVD! “The best chain-saw flick since the original TEXAS CHAINSAW MASSACRE. Head roll before the titles roll. Splatter City. – Special 5.1 audio option – the Vine Theater Experience! – First 3000 units include an actual jigsaw puzzle! Strictly limited to 3000 units! We will be celebrating the release of PIECES in BOSTON, where the movie’s gruesome events take place, Feb. 26 & 27 at the Coolidge Corner Theatre! 35mm print! More screenings to be announced soon! As Bob Murawski and the team at Grindhouse Releasing are hard at work completing the upcoming Blu-ray releases including PIECES, I DRINK YOUR BLOOD, CAT IN THE BRAIN, and SCUM OF THE EARTH, the leading horror and exploitation film distributor is unleashing a nationwide series of theatrical screenings of Sam Raimi’s original EVIL DEAD in advance of the new ASH VS. EVIL DEAD series on Starz! Also screening in theaters this Halloween season from Grindhouse Releasing are Lucio Fulci’s THE BEYOND, Umberto Lenzi’s CANNIBAL FEROX, Ruggero Deodato’s CANNIBAL HOLOCAUST, and more! 10/3/2015 – EVIL DEAD, BeyondFest – Egyptian Theatre, Hollywood, CA – with Bruce Campbell! 10/4/2015 – THE BEYOND, BeyondFest – Egyptian Theatre, Hollywood, CA – with Fabio Frizzi / Frizzi2Fulci Live! 10/9/2015 – CANNIBAL FEROX, Skyline Drive-in, Shelbyville, IN – double feature with THE GREEN INFERNO! 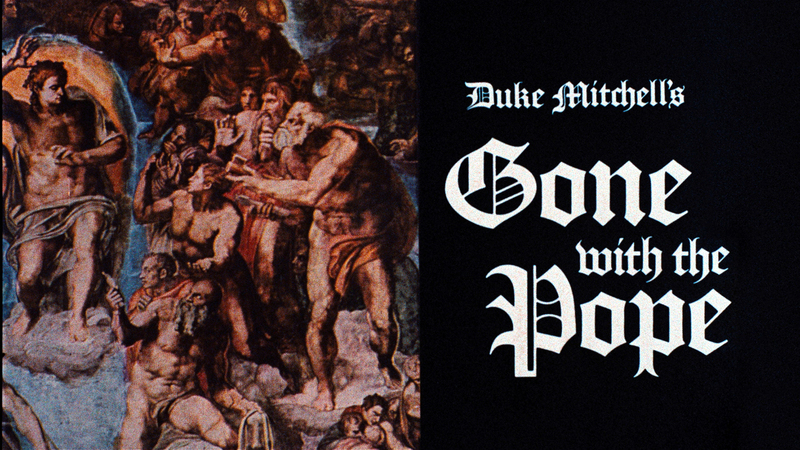 Duke Mitchell’s GONE WITH THE POPE: It’s A Hit! 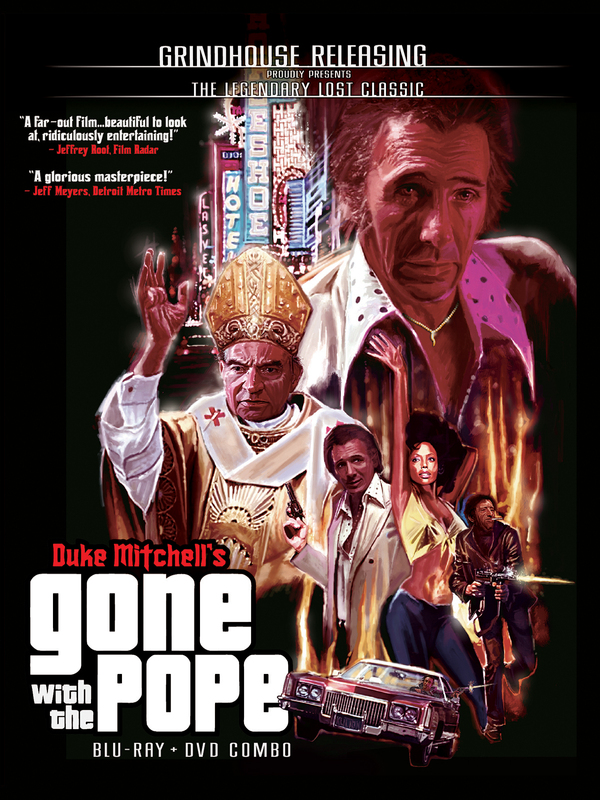 This Easter, home video audiences are celebrating the miraculous resurrection of Duke Mitchell’s GONE WITH THE POPE, the long-lost follow up to the smash hit MASSACRE MAFIA STYLE! At last, the cult hit hailed as “a glorious masterpiece” (Detroit Metro Times) is here on home video! Legendary nightclub entertainer, crooner and “Mr. 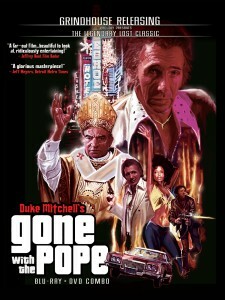 Palm Springs” Duke Mitchell stars in GONE WITH THE POPE as a gangster with an unholy scheme: to kidnap the Pope in exchange for the ransom of a dollar from every Catholic in the world! 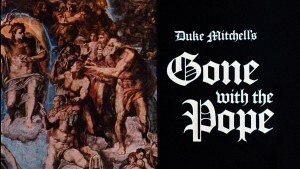 Duke Mitchell filmed GONE WITH THE POPE in 1975, but the movie was left unfinished at the time of his passing in 1981. Sage Stallone and Bob Murawski of Grindhouse Releasing rediscovered GONE WITH THE POPE in 1995 and vowed to save it from obscurity. 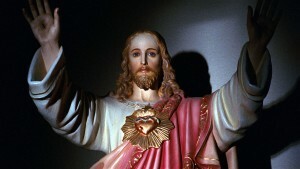 Academy Award-winning film editor Murawski (THE HURT LOCKER, SPIDER MAN 1, 2 & 3, ARMY OF DARKNESS) spent 15 years completing GONE WITH THE POPE from the surviving film elements. The result is the Holy Grail of Exploitation Cinema! 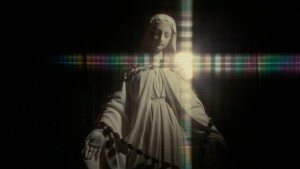 GONE WITH THE POPE played exclusively in 35mm at theaters and festivals around the globe for five years. 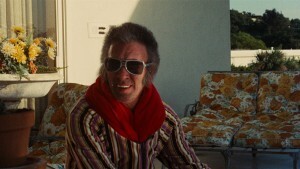 The film has played repeatedly to an enthusiastic cult audience at the Quentin Tarantino-owned New Beverly Cinema in L.A. and the fantastic story of its unlikely rescue and restoration was featured in Variety, LA Weekly, Movieline, and the Los Angeles Times. Now Grindhouse Releasing has at last answered years of worldwide demand for GONE WITH THE POPE on home video with a stunning deluxe Blu-ray/DVD set…and it’s a hit! Customers are already calling it the cult Blu-ray release of the year! Available now, along with Grindhouse Releasing’s acclaimed, best-selling new Blu-ray editions of MASSACRE MAFIA STYLE and Lucio Fulci’s THE BEYOND, Duke Mitchell’s GONE WITH THE POPE is being hailed as a miracle by fans and critics alike! “Gone With The Pope is testament to how ambition and passion are always more important than a big budget or a famous cast. It’s a film like no other, an eighty-two minute barrage of ideas that are simultaneously insane and profound as Mitchell takes on the hypocrisy of organized religion without ever really writing off the spiritual side of life. It’s a skewed and strange vision to be sure but it’s relentlessly entertaining, as politically incorrect as they come and really just a wild ride all together. Grindhouse Releasing have rolled out the red carpet for the film, giving it the best possible presentation and jamming the disc with extras that are as interesting as they are comprehensive.” – Rock! Shock! Pop! 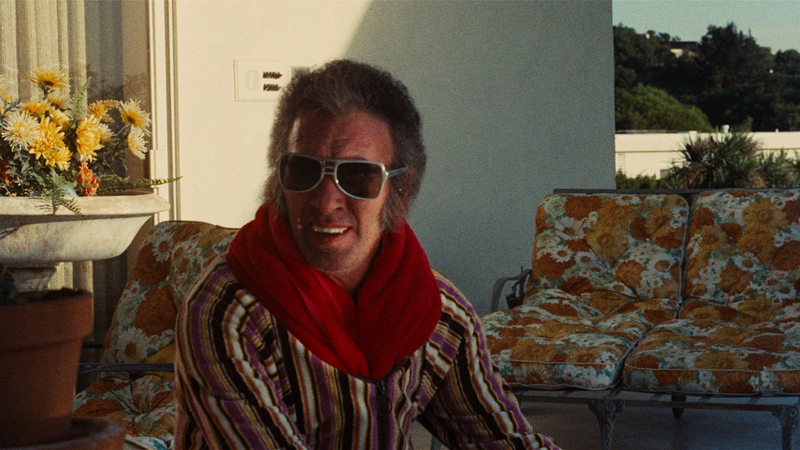 Get the mind-blowing MASSACRE MAFIA STYLE Bluray/DVD here! Grindhouse Releasing is a Hollywood-based film distribution company co-founded in 1996 by Sage Stallone and Academy Award-winning film editor Bob Murawski. 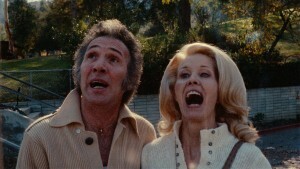 Devoted to preserving, restoring and releasing the best in exploitation cinema, the label has earned the rep of “The Criterion Collection of cult” for its no-expense-spared restorations of such celebrated Italian horror films as Lucio Fulci’s THE BEYOND, Umberto Lenzi’s CANNIBAL FEROX, and Ruggero Deodato’s CANNIBAL HOLOCAUST. Through the Box Office Spectaculars imprint, Grindhouse has released David Durston’s I DRINK YOUR BLOOD, Lucio Fulci’s CAT IN THE BRAIN, and J.P Simon’s chainsaw classic PIECES. In recent hyears, Grndhouse Releading has entered the Blu-ray market with acclaimed special editions of Amos Sefer’s AN AMERICAN HIPPIE IN ISRAEL,starring Asher Tzarfati and Shmuel Wolf, Robert Hartford-Davies’ CORRUPTION, starring Peter Cushing, Sergio Sollima’s THE BIG GUNDOWN, starring Lee Van Cleef and Tomas Milian, and the #1 best-seller CANNIBAL HOLOCAUST, starring Robert Kerman and Carl Gabriel Yorke. In 2015, Grindhouse Releasing won the Satellite Award for Outstanding Overall Blu-ray/DVD for its special edition of Frank Perry’s THE SWIMMER, starring Burt Lancaster, which includes the original documentary “The Story of THE SWIMMER” by Academy Award winning film editor Chris Innis (THE HURT LOCKER). Grindhouse Releasing once again scored a #1 Amazon best-seller in 2015 with the lavish 3-disc Blu-ray/CD release of Lucio Fulci’s THE BEYOND, sure to top the list of the year’s best horror discs. MASSACRE MAFIA STYLE and GONE WITH THE POPE are among the most long-anticipated titles in the Grindhouse Releasing catalog and the lvish Bu-ray/DVD sets are rapidly gaining acclaim as some of the studio’s finest work to date. Grindhouse Releasing is also the most active independent theatrical distributor of classic horror and exploitation films in the U.S., handling Sam Raimi’s original classic EVIL DEAD and other genre landmarks in addition to its own catalog of titles. Upcoming Blu-ray releases from Grindhouse include CANNIBAL FEROX, out May 12, and more to be announced soon! Grindhouse Releasing Presents CANNIBAL FEROX Blu-ray! Grindhouse Releasing is proud to present Umberto Lenzi’s CANNIBAL FEROX in a new 3-disc Blu-ray/CD edition! Scheduled for release May 12, this deluxe set is available now for pre-order exclusively from Diabolik DVD! Banned in 31 countries, CANNIBAL FEROX assaults your senses as a group of Americans lost in the jungles of Amazonia experience brutal retribution at the hands of blood-crazed cannibals. Shot on location in the savage Amazon wilds of South America, CANNIBAL FEROX is one of the most violent and shocking films ever made. There are at least two dozen scenes of barbaric torture and sadistic cruelty graphically shown. If the presentation of disgusting and repulsive subject matter upsets you, please do not view this film. – SHOCKING deleted scenes – lost for over 30 years! CANNIBAL FEROX Deluxe Edition copyright 2015 Grindhouse Releasing, Inc.
Visit www.GrindhouseReleasing.com for updates and news on our Blu-ray releases and screenings of CANNIBAL FEROX, GONE WITH THE POPE, MASSACRE MAFIA STYLE, PIECES, THE BEYOND, CANNIBAL HOLOCAUST, SCUM OF THE EARTH, and the 35mm theatrical-only smash hit TRAILER APOCALYPSE!